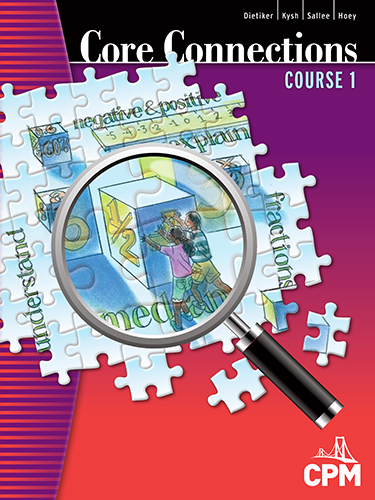 Core Connections, Course 1 is the first of a three-year sequence of courses designed to prepare students for a rigorous college preparatory high school mathematics course. Collect, organize, and display data in multiple ways. Analyze data using measures of central tendency. Represent data sets using various methods and analyze how changes in data impact the representation. Represent and compare quantities using manipulatives, diagrams, and number expressions. Represent multiplication using rectangular arrays. Represent integers on number lines and with manipulatives. Make sense of multiple representations of portions (decimal, fraction, percent) and convert from one form to the other. Compare fractions and generate equivalent fractions. Recognize ratios in tables and graphs and solve corresponding problems. Use ratios to describe relationships with similar plane figures and other situations. Use models and standard algorithms for computations with fractions and decimals. Simplify variable expressions by combining like terms and using the Distributive Property. Evaluate variable expressions and solve simple equations and inequalities. Solve distance, rate, and time problems. Solve percent problems including those with discounts, interest, and tips. Compute area, surface area, and volume of rectangular solids.